The all star breaks are over and all the teams in the organization are back in action. Tyler Viza had today’s pitching gem, an eight inning two-hitter for Reading. Bailey Falter picked up his first win for Williamsport with a solid six inning effort. Lehigh Valley (53-39) Beat Buffalo, 6-1. David Buchanan (5-5, 4.56) went seven innings. He allowed one run on five hits and three walks. Every IronPigs’ starter had at least one hit. J.P Crawford had 3 hits, 3 RBI, and his 3rd HR. Emmanuel Burriss (.309) had 3 hits. Taylor Featherston (.274), Nick Williams, Brock Stassi (.263), and Darnell Sweeney had 2 hits each. The IronPigs had 17 hits, but only hit 3-14 with RISP and left 13 runners on base. They turned 3 DP behind their pitchers. #1 Crawford (.279) went 3-5 with a HR (3), 3 RBI, and 2 K.
#3 Williams (.284) went 2-5 with 2 doubles. #17 Cordero – DL shoulder, rehabbing in the FSL with Clearwater. #23 Sweeney (.237) went 2-4. Reading (64-27) Beat Trenton. 4-2. Tyler Viza (3-2, 4.06) tossed a two-hitter over his eight innings. He gave up 2 runs, walked none, and struck out seven. Miguel Nunez (3.04) came on to pick up a one-out save (11). KC Serna (.303), Jorge Alfaro, and Jake Fox had 2 hits apiece. Fox hit his 16th HR and drove in his 54th run. #6 Alfaro (.297) went 2-5 with an RBI (47). #18 Pivetta – (8-4, 3.14) – DNP. #19 Hoskins (.287) went 0-4. 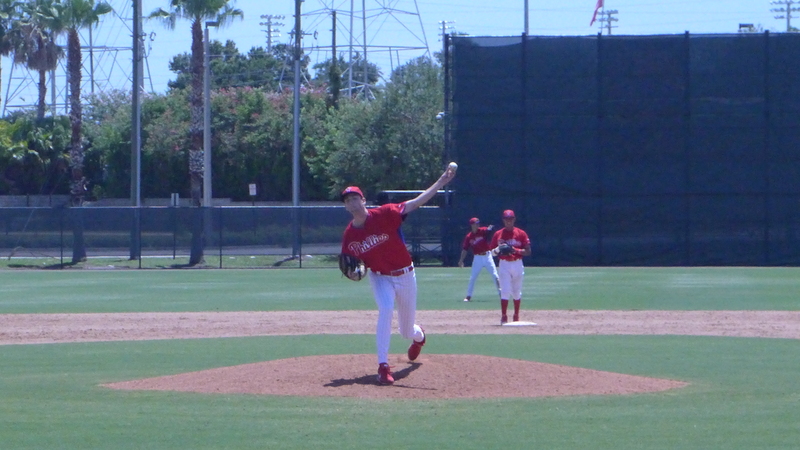 #22 Cozens (.286) went 0-5 with 3 K.
Clearwater (52-37) Beat Palm Beach, 8-6. The Threshers spotted Luke Leftwich (7.88) 4 runs in the first. He was lifted in the second before he could give it all back. The Threshers kept tacking on runs, and Will Morris (3.30) and Joe DeNato (2.93) gave 3 more back by the sixth innings. Jimmy Cordero (1-0, 3.00) pitched two no-hit innings in his second rehab appearance, striking out two and walking two. He got the win while Matt Hockenberry (1.24) got his first Threshers’ save. Kyle Martin (.255) had 3 hits. Carlos Tocci, Scott Kingery, Derek Campbell (.347), and Drew Stankiewicz (.222) had 2 hits each. Kingery and Jiandido tromp had 2 RBI each. #11 Kingery (.289) went 2-5 with a triple and 2 RBI (25). #14 Tocci (.274) went 2-4. #21 Garcia (8-2, 2.23) – DNP. Lakewood (40-50) Lost to Hickory, 4-3. “C” Randolph went 3 for 3 and walked twice. Coppola, Tomscha, Garcia, and Grullon had 2 hits apiece. Grullon hit his 6th HR and picked up 2 RBI (30). #5 Randolph (.282) went 3-3 with 2 BB. #8 Kilome (2-7, 4.75) – DNP. #20 Tirado (1-1, 6.20)- DNP. #24 Pujols (.231) went 1-5 with 4 K.
#29 Grullon (.242) went 2-5 with a HR (6) and 2 RBI (30). Williamsport (15-12) Beat Vermont, 6-2. Bailey Falter picked up his first win. He allowed 2 runs in the first inning, but held the Lake Monsters to two hits the rest of the way. Falter pitched 6.0 innings, walked none, and struck out five. Will Hibbs pitched two, no-hit innings. Arquimedes Gamboa had 3 hits. David Martinelli and Gregori Rivero had 2 hits each. Martinelli and Darick Hall had 2 RBI apiece. Juan Luis (.286) went 1-1 as a pinch hitter. #16 Medina (3-0, 0.64) – DNP. GCL Phillies (11-7) Lost to the GCL Blue Jays, 10-4. An 8-run fifth inning put an end to the competitive portion of this game. Mauricio Llovera (2-1, 2.70) faced three batters in the fifth without recording an out. Luis Gonzalez (9.00) got an out, but it took 6 batters before he got that. Randy Alcantara (3.60) got the final two outs of the inning, but allowed an inherited runner to score. The Phillies trailed 10-0. Cole Stobbe had 2 hits including a double. Aaron Altherr played the entire game and went 1-3 with 2 walks. Alcantara pitched the sixth inning. He struck out 2 of the six batters he faced. The only runner to reach base did so on a fielding error. Tom Windle made his second rehab appearance. He struck out one in one inning of work. He allowed a base hit and a walk. Kyle Young made his second appearance. He pitched two innings and allowed a double in his second inning. He struck out one and walked none. Kyle Young got his first batter to hit a fly ball to center fielder, Mickey Moniak. Watch how far Moniak goes to make the running catch. Young induced a shallow pop fly to left fielder Malvin Matos from his second batter. Young got another fly ball to Moniak from his third batter. He has a nice easy motion for a kid that stands 6’10. His curve ball has some nice bite on it. His fastball was 88 mph in his first inning. #? Mickey Moniak (.275) went 1-4 with a BB. #? Kevin Gowdy (0-1, 0.00) – DNP. #? 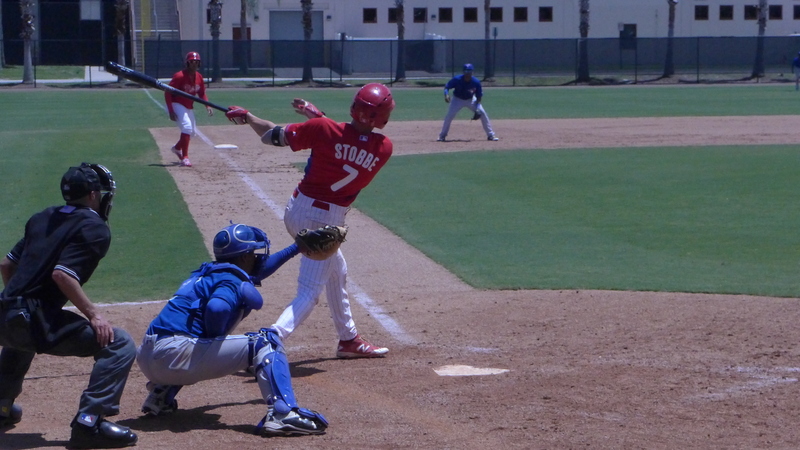 Cole Stobbe (.286) went 2-4 with a double and stolen base. #25 Jhailyn Ortiz (.279) went 0-3 with a BB. #? Josh Stephen (.282) DNP. #?Justin Miller (0-0, 4.15) – DNP. #? Will Stewart (0-1, 2.57) – DNP. #? Nick Fanti (1-0, 1.53) – DNP. DSL Phillies (14-21) Beat the DSL Athletics, 4-2. Sandro Rosario (3-3, 3.35) pitched seven, two-hit, shutout innings. Jonathan Guzman (.287) went 1-4. Keudy Bocio (.234) went 0-3 and a sac. Simon Muzziotti (.274) went 1-4. Dixon Gutierrez (.306) went 1-4. Leonel Aponte (2-3, 2.70) – 5.0 IP, 5 H, 3 R, 2 ER, 1 BB, 2 K, 1 HR, 1 WP, 1 Balk, 1 HBP. Rafael Marchan (.304) went 0-3. 7/14 – Lehigh Valley released RHP Edward Mujica. 7/14 – Anthony Vasquez assigned to Reading from Lehigh Valley. 7/14 – John Richy assigned to Clearwater from Reading. 7/14 – Reading activated RHP Ricardo Pinto from the temporarily inactive list. 7/14 – Reading activated RF Dylan Cozens from the temporarily inactive list. 7/14 – RHP Rafael Carvajal assigned to DSL Phillies. Crawford’s bat really heatin up. The HR, it was 1st and 2nd, he tried twice to bunt them over but with an 0-2 count they took the bunt off and after very wide ball he crushed a hanging CB to the RF. Great to read Randolph on base 5 times, only got to see him once this year and it was the first week when he was struggling. Should get to see him on Milb.tv one more time I believe. Grullon with a couple HR’s in the past week or so. Great the HR Crew come back and K ‘d Cozens 3 . If al theml could not stike out and walk more they could be knocking on CBP in no know time. Jp Crawford now he’s almost there he needs to hut just a little bit more . C looking good keep raking Kingery changes speed hits a triple. Grullon now with 3 in a row HR’S he finding power to go with good D.Falter doesn’t walk anyone 0 BB in last 3 starts . Pujols k’s 4 times geez sometimes you have to wonder. How much more hitting would you like J.P. Crawford to do? Since he made the adjustment to AAA pitching, he’s taken off like a rocket. He’s got a 1.165 OPS in the month of July, including 3 home runs. I’ll go on record now to say that if Crawford hits 15-20 homers a year in the majors he’s going to be one of the 15 or 20 best players in the majors. He’s incredible. I hope you didn’t jinx JPC. Remember the Cody Asche prediction from 2013? Romus – you crack me up. I still haven’t given up on Cody (he came up when he was pretty young and he DOES have a great swing), but I feel pretty comfortable in concluding that J.P. is a much better prospect. And, remember, I qualified my comment on Crawford – I basically said IF he acquires slightly above average power he’ll be a star. If he hits, say, 5-8 homers and 30 doubles, he’ll still be a very good player (3-4 WAR), but that wouldn’t make him a star. My sense is that he, indeed, will become a star, but it might take a few years. But, as soon as he comes up, he’ll be a pretty decent upgrade over Galvis, who’s a neat fielder, but just has too many holes as a hitter. I love how this kid works the count. But his power, is something I have no idea what he will be. he is only 21 yrs old. could get stronger. I know I was never a fan of Cody, I just think he is a 240 hitter with limited power. until he proves over wise. Plus is below average fielder. Yeah even if he played a full season I doubt he tops 15 HR a year maybe 17 if he goes on a streak, but still I don’t see him doing much better than hitting 260/250. He strikes out too much for someone not providing more power. He’s a plus 20% K rate every year he’s been in the league and that’s followed by a so so walk rate although this year he’s close to 9%. If he was a better third basemen maybe some team could live with that, but here he just isn’t much more than filler. Can you guess his ops so far this yr .793 ops he walked 4 times in the last 3 gsmes. Now I’m not saying he can keep it up but he does give better at bats this yr.
@Tim yes I know his numbers this year and he’s his walk rate is higher than it ever has been in the majors. He’s striking out less than usual too, but still over 20%. He has been better with his at bats, but he’s still got to keep it up for a longer period. Hey I can’t think of another reason.lol I let Joe Jordan do his job but JP making it real easy. Something I haven’t seen before – Tobias, hitting after Randolph, had 10 LOB last night with his 0-5. That’s a tough night by your #3 hitter in a one run loss. And I think it’s time to quiet the Pujols talk until he puts himself back on the radar and up a level. There are plenty of legit outfield prospects in the organization to discuss. A 20 year old showing legit in game power doesn’t need to be soured on. Crawford certainly needs no hype but he’s hit in 12 of his last 13 games. 7 have been multi-hit games. He’s had 3 doubles and 3 HRs in that stretch. His BA has increased from .227 to .279. Pujols has 19 Ks in his last 10 games and 13 in his last 5. He has 127 in his 82 game season so far. Does anyone know who holds the minor league record for most strike outs in a season by a hitter? I’ve been searching for the answer but can’t find it. Pujols might reach it no matter what it is. If I look at his splits, if they only pitch him in away games (.269 vs .190), in night games only (.250 vs .169), against left-handed pitchers only (.258 vs .220) and you squint really hard, there might be an average player in there. He’s young… I know but he should be getting better each month not worse. He’s hit .256, .250, .202 and .190 in April through July. It’s not going in the best direction. The HRs are nice and prolific. He’s hit 9 of his 17 HRs at home which is impressive since that ballpark saps power from hitters. The power is for real but this is A ball folks. Imagine, as he rises in the ranks, how his inability to make contact will be further exposed. Can a guy hit 30 HRs while only putting 30 balls in play? Arquimedes Gamboa has been hot and getting more press on this site. He’s hit in 6 straight games. He’s hit .407 over that stretch. bellman……Pujols is a real enigma. All the essential tools are there, but one…cannot hit the curve . Perhaps the Latino version of Anthony Hewitt. The OF is crowded anyway in the system…I say put him on the mound in the FIL and see what that cannon of a right arm can do from 60.6. He probably can’t throw a curve ball either. Man I really wanted to see Viza pitch last night. I drive right past that stadium every day to and from work and last night you could see the stadium was filling up fast with Phillies fans. I’m sitting at the light and I would say 4 out of 5 fans crossing at the light headed in were wearing Phillies not Yankees gear. DMAR- where are you from? Just asking I’m literally 5 mins form the ballpark as well, not in Trentkn tho thank god. I went to the Reading Phillies game at Trenton last night. Tyler Viza indeed pitched a gem. Except for the two hits in the first inning, he was brilliant. 70% strikes. Never close to walking a batter. Nice combination of K’s, fly out, pop ups and ground outs. He had it all working. FB was 89-91. Off-speed was 75-77. Had a couple innings where he might have thrown less than 7-8 pitches. The staff had 24 consecutive out against Thunder. That was from the HR blast in the first to the RF looper allowed by Milner in the 9th. Outstanding job. Hits had lots of singles but the Bash Brothers had a rough night especially Cozens who struck out three times, grounded into a DP and a sharp grounder to 2nd base. One thing I noticed and it’s not just Cozens but all the K’s were on pitches that were 85 or sower. Cozens really struggles with the off speed stuff. No way I move him to AAA this year. This is the second time I have seen Alfaro in person. I still have not seen him hit anything soft. Even his ground balls are hit hard. He also busts it out of the box and moves well for a big guy let alone a catcher. He beat out a ball hit down the 3rd base line and almost beat out another ball. He was robbed of an RBI with the single in the 9th. Fightin’s had runners at 2nd and 3rd, Alfaro shoots one to RF that easily scores two but Osmel Aguila hurt himself going from 2nd to 3rd. He limped into 3rd. It wasn’t a hamstring which I thought might be the case. Something below the knee. He left the game. Great night. A little disappointed that bat dog only worked the Thunder second inning. Great to watch him and a great feature on him that ESPN did. It was hot and little breeze last night so many he got pulled early. I am very upset that the New Britain Rock Cats moved to Hartford. I used to see Reading play in NB 3 or 4 times a year. I’m not going to drive to Hartford for any games because I drove there for 29 years when I worked there. The cost of parking and the game will get prohibitive fast and who wants to spend a few hours in Hartford anyway. This year I can’t watch them at all because the stadium isn’t built. Pretty impressive that the Yard Goats are doing so well and haven’t really played a home game. They try to play around the state but mostly they play in opponents stadiums. Where in Connecticut do you live, Bellman? I grew up in Westport. I’m in Avon and also lived in Bristol and Stamford before that. 91 I Hope that radar gun was slow. Roccom, you’ve made a lot of comments about velocity recently (especially with righties) and while I don’t always agree with you, I generally agree with your concerns about velocity (again, especially with righties). Whenever the issue of velocity comes up on this site, someone makes at least one of two specious arguments. The first argument is where they trot out examples of guys who throw hard but have not been successful as pitchers. Therefore, they argue, velocity doesn’t mean very much. The second argument is where they provide examples of pitchers who don’t throw hard and have been successful. Again, they use these examples as proof that velocity doesn’t mean much. Both arguments are utter nonsense. First, as for the unsuccessful hard throwers. Of course throwing hard does not, alone, make a guy good pitcher. He needs to do a number of things to be successful. If you can’t throw a strike, flash decent secondary pitches or if your ball is straight and down the middle, sure, you’re going to get hammered. Second, for the successful soft tossers. Sure, there are very, very rare exceptions where guys who are soft tossers are successful. Many of these pitchers are specialty pitch guys (knuckballers, guys who throw a splitter, etc. .. ) and the rest are typically lefties, although there are a few righties in the mix. However, these players are RARE exceptions. Typically, if you don’t throw relatively hard, it’s going to be virtually impossible to be successful at the major league level. And with many of these guys, they get back in the lower and mid minors (sometimes even the upper minors) because minor league hitters can rarely hit a decent breaking pitch that is thrown for a strike. But when these pitchers get to the major league level, good major leaguers can either hit or fight off decent breaking stuff and when those hitters finally get a fastball in the zone – if it’s not thrown hard, they typically don’t miss that pitch. For every Greg Maddux there are a thousand Drew Carpenters. Neither of these arguments is persuasive. The truth is that while having good velocity doesn’t make you a good pitcher, it makes it much easier to be successful, and without good to decent velocity, it is much more difficult, often nearly impossible, to be successful. To put a finer point on it, having good velocity gives a pitcher more margin of error; and the higher the velocity, the higher the margin of error. Look, I love Aaron Nola and I think he is one of the exceptions to the rule (I also think that, over time, he’s going to regain some of the velocity he inexplicably lost this year). But his recent struggles show just how little margin of error a righty pitcher has who throws about 90 MPH. To pitch well at 89-91 MPH, Nola needs to throw multiple pitches with outstanding command and outstanding movement. If he falters in any way, he gets his brains beaten in. Compare him to Vince Velasquez. When Velasquez has his really good, high velocity, moving fastball working, he almost instantly becomes a world beater, especially when he combines that with just a decent breaking pitch that keeps hitters honest. But please, folks, stop with the arguments that velocity isn’t important. It’s certainly not everything, but it’s REALLY important. like everything else – overall pitching stuff is determined by quality (type of pitches, location, command and control) and quantity/measurable (velocity, ball spin, etc). velocity alone doesn’t define the pitcher’s “stuff” but it can widen the margin of error when getting the batters out especially the average to below average batters who can be blown by velocity alone. You said it better than I have. But its the point I been saying for a while. As the fastball gets faster, the hitter has less time to react to it, and must decide to swing faster than with a slower fastball. This makes the hitter more susceptible to fastball movement and offspeed pitches. As catch alludes to, fastball velocity increases a prospect’s floor and ceiling. Their floor because they can easily translate into the back of the bullpen, while soft tossers are limited to long relief. Their ceiling because when their velocity is combined with control and good offspeed pitches, they become dominant. Another quick example . . . Why do you think sometimes when position players (who have good arms) fail they will try and get on the mound . . . It’s bc they at least know they can throw hard and hope they can be taught the rest. What would you call an good avg velo for Right Mlb pitchers.91 93 with the ability 95 or 93 to 95 with ability to hit 97. This yr break down top 40 eligible Era pitchers right now in baseball. There are 2 K ballers they out , 3 are hurt 9 are LH. THAT is 14 out of 40. Now RH pitchers 26 in top Era in 40 Eras. We all know R Porecello, D Fisher, Corey kluber, B Colon, J Cueto , K Meada, T Roark, Klye Hendricks are all in that soft toss RH 90 92 hit 93 .that’s 22 pitchers 18 hard throwing RH pitches about 48 % of the top 40 Era pitchers. Now out 18 hard throwing RH 5 are on ings pitching count. That leaves 13 hard throwing RH pitchers in the top Era .the lowest being 2.47 the highest 3.95 . Now hard throwing RH are fun because they can K some players but that doesn’t guarantee wins. Tim your really need to learn the game. Your clueless. its a shame. ‘What would you call an good avg velo for Right Mlb pitchers.91 93 with the ability 95 or 93 to 95 with ability to hit 97’….as an example, Aaron Nola may fit in the first category and ViVe fits in the second. Now it comes down to their secondary stuff and their ability to command/locate. Clearly Nola had that advantage…..well, up to 5 games ago….but historically he has that exceptional command. Velasquez has it on occasions but he surely can overcome that with his higher velo. It is very difficult to discern the difference in a pitcher’s value based on readings like that. RHP pitchers in the less than 91mph readings…..well that seems to be a more obvious conclusion, whereas their counterparts, LHP, can do well with greater command. The outlier pitched last night, Bartolo Colon. I was there too. Sitting behind a guy wearing a Tyler Goeddel jersey. Im not joking, how did he even get that lol. Viza was great, im very high on him. Its funny because in the first the first two batters reached and I said to my wife “ok, now these next three guys are the ones you want to pay attention to and remember” and then they went down in order haha. I feel like reading didnt even play all that well and still won with ease. what a great team. Chase the dog is awesome too. Danurda8888. Does he have good offspeed stuff? I am not going to pretend to be a scout like some do, but he certainly wasn’t overpowering hitters. He just made everyone look uncomfortable and off balance, especially once he got into a groove. so i would assume that would be due to his offspeed stuff. you may be able to get a much better answer from somebody else. Go ahead and pretend. Rocky does. ANonymous shows you a coward to use your name ,but I keep saying what I know and just prove me wrong. I Use my name. coward and the three who gave you a star. Romus I said a ton of times, Left handers can get away with less. I love how I say things and people think I hate the Phillies, or don’t know the game. I told you I was concern with nola when he was going good. Cause his velo was down. and what happen. I also state that you will have some with low velo who wlll be good. But catch stated it well. I Am done with tim talking to him, is like talking to two year old. I really only try to talk to you. mostly. All I ever said is prove me wrong when I say something. that to me is simple. All you have to is look at mlb box scores for 1 wk other then the phillies. Then tell me why the Hr’s Way up the scores are why up.the Era are up. That’s all every major outlets are talking it . Hr per game will make history his yr. Never in major league baseball history has HR’S hit at such a high rate. was looking up how old Jake Fox is (33) and based on milb.com stats, that was his 200th minor league home-run, in 3765 at bats. With no MLB on, enjoyed part of the MLB Network special on Mike Piazza. Has home video of Ted Williams in Piazza’s back yard in Phoenixville area watching 15 or 16 year old Piazza in homemade batting cage, trying to give compliments like “i didnt hit the ball that hard when i was 15”. Jake also had 20 HRs in 489 Major League ABs. Randolph reached base all 5 plate appearance. Nice night! Nice roster, L….but there’s only 5 bench slots available (unless the new CBA expands the roster). Quinn needs a full year in good health before he’s a consideration. I doubt they would keep 2 RH hitting 1bmen. Jury is out on whether Knapp is a catcher, perhaps a super utility guy who can play 1b, OF, DH as well as 3rd catcher so you would need a #2 on bench. I love rankings and putting together a roster but sometimes it’s counterproductive to predict a line up 3 years down the road because of many variables – most probably will show a different picture when it actually happen. I rather be excited to predict the starting roster for 2017 (and not 2018 and onwards yet) and project what will the next core of a good Phillies can do. The September expanded roster and the next Spring Training will give a snap shot of that — which is almost around the corner. Anyway, here are my comments in your line up. 1) Of the 15 position players you listed, 1/3 of them may no longer with the Phillies uniform by 2018/2019. Phillies with significant $$ after 2016 will flex it’s financial muscle to buy proven bats. 2) Between Doobie, Quinn, Altherr (CF) and Williams, Randolph (LF) – something gotta give – at least 2 will be traded. 3) Galvis may not make the 2018 team, more so 2019 – even for a Blanco type role. Phils have a lot of utility INF that can fill a Galvis role. 4) Hoskins – if he’s good as he is projected now, will bat ahead of Franco and probably bat #. Williams is he’s with the team – will bat between 2 RH bats. 5) The 2019 team will have 2 big FA signings – although I think Phils can put together a contending team by 2018/2019 coming from the current team and from the farm — prospects come with risk so augmenting the team with proven MLB players via FA is a good decision. correction on Hoskins – if he’s good as he is projected now, will bat ahead of Franco and probably bat “#3″…. If he becomes the player he has the potential to become, Hoskins is a classic #5 hitter – not the best hitter on the team or even the best power hitter, but a really fine power hitter who can drive in more runs after the #3 and 4 guys have hit. That said, people are unfairly giving Tommy Joseph short shrift. Joseph has overcome enormous odds to do what he is doing and he’s still improving. Joseph lost the vast majority of his playing time from 2013-15 with concussions. As an article written yesterday further revealed, he also had a visual condition that prevented from properly focusing his eyes on incoming objects – kind of a problem for a hitter, don’t you think? So, now, Joseph has overcome the concussions, he’s rehabbed his eye condition (which was discovered by accident and is unrelated to the concussions), he’s changed positions, he’s gotten into great shape and he’s a man on a mission who is finally getting at bats. And guess what, he has 65-70 in-game power, is pretty nimble at first and is making adjustments. He’s something of a marvel and why people think he doesn’t have the ability to continue to get better is a bit of mystery to me. This is a very long way of saying that we should not discount him, arbitrarily discard him or assume that Hoskins will be a better major league player than him. I THINK Hoskins will end up being better (I’ve always been a huge Hoskins fan), but I don’t really know if that’s true and I am perfectly willing to just sit back and watch these guys battle it out for first base supremacy – this would be a healthy competition. @catch – I’m not that high on Hoskins than most so I agree with a potential #5 hitter but I can also see Williams in that #5 spot if the top of the line is too LH heavy. my #3 projection is based on what most think of Hoskins – which potentially can be a “Goldschmidt lite”. I understand the Joseph is a good comeback story and somehow removes some of the Hunter Pence stigma if he can be (close to) the player he was thought he will be. but with TJs limitation to 1B – this might make him expandable since Franco, Hoskins and potentially Cozens (and even Ortiz) might present as better option than him. I’m not saying that TJ is bad, but he may become expandable due to the better options as I state earlier. You’re right, he might become expendable, but it’s also quite possible that he ends up being the best first base option – people are selling him and his potential short in my view. Alas, the sleeping giant will awaken by 2018. Good post, KuKo. I keep forgetting how free agency will play into the makeup of this roster. I only hope it’s by opportunity alone and not necessity. Let’s pay the homegrown talent first and like you said, augment the team with a piece here and there. with the wallet opening up after 2016 – the Phils are ripe to sign a top FAs in 2018 in the likes of Harper, Machado, Kershaw, Fernandez, Donaldson, Pollock, McCutch, etc. @Kurdt- Harper’s going to cost in the neighborhood of $400mm. Any chance the Phillies are interested in writing that sorta check? @rick – for me, I don’t see the Phils taking Harper who will probably go to the Yankees. But taking a shot at Machado (and move Franco to 1B) is something I want them to do which will probably cost them $200M++. @romus – Donaldson will be 33 yo that time so I don’t think it will be smart for the Phils to sign him big $$ unless it’s only 2 or 3 years contract. With the depth in OF especially in CF (and Mickey Mo is probably just a year or less away by that time) – does it make sense to make a splurge on Pollock? Middleton’s machismo will make the Phils spend big time $$ and they can outbid BALT for Machado. The Phils with good pieces and $$ — it can be an enticing team for Machado to sign. Other than the bats, I also want the Phils to get one of the top aces. KuKo…..that is one reason those players will be available and other top positional players will probably be locked up well before they hit the FA market. I like to hope the Phillies may be able to get Trout…who may be available entering 2021 when he turns 30 or trade for him the year prior then work out an extension. But LAA will probably extend him at mega millions. @romus – I can Trout’s homecoming in 2021 if the Phils becomes a legit WS contender and the Phils can match LAA for Trout $ for $. KuKo….I keep hoping the Angels can play .500 ball for the next 3/4 years…..so they draft in the middle of the pack. And finally have to decide to get a boat-load for Trout in a trade for them to break out of their doldrums. But their owner will probably not let Trout ever walk FA…so it must be a trade. yeah, a big part of that is the recovery and success of Richards, Heaney and Skaggs. LAA can always make a push especially with Trout but that barren farm system of them will rear it’s ugly head. I agree with you that a trade of Trout is most likely than FA signing — and whoever is going to break their farm will need an assurance that Trout will sign long term. Dang, if I wasn’t moving to California in two weeks I’d have time to check out the Crosscutters who are making a rare appearance in Burlington, Vermont to play the Lake Monsters. Nice performance by Bailey Falter last night. Would have loved to see Jesus Alastre (20 for 41) and Adonis Medina, who is starting tomorrow. Vermontphil ..Wher r u in Vermont? I am in S Btv and do the scoreboard for the Lake Monsters…Email me..
Just sent you an email…hope it’s the right address. wow! GCL scored 11 runs after 5 IP without MickeyMo!! Exciting young prospects like Stephen, Ortiz, Stobbe, BenPel and Brito are hitting well! Gowdy 2ER 3K 0BB in 3 IP. Moniak was coaching first base, so maybe he DID have an impact on the game. That kid Stephen is the kid to watch. Watch video on him. Sweet swing .to all fields. My personal favorite draft pick so far. from what I have seen. Of course not counting mickey who has a really nice swing . rocco…….he was rated the third best HS hitter in California behind only Moniak and Rutherford. I didn’t know that. ty. Romus am in love with his swing. His approach from what I saw was to hit it where it was pitched. Stephen belted his 1st profession HR while Ortiz stole his 1st base. Altherr has played 5 games in the GCL. He’s played two full games in a row. It’s time to move him up. If they need to monitor his rehab, he could go to CLW (A+). It would continue his push toward the majors and allow him to continue his rehab. I’d rather see Moniak, Stephen, Ortiz and Pelletier play a lot more. Or move Mickey Mo to Wmsprt. I like to see Altherr moving forward on his rehab but the GCL has tons of talent that really need to play everyday. bellman…they may want to keep an eye on him initially, around the complex….so maybe CLW next stop up, before heading north. Romus I got to believe that the nats. with all those spread out long term contracts. If they don’t get young guys, who they can control. it has to catch up with them. Rizzo has a way with contracts…deferments seem to be their forte. I cannot see Rizzo finding some way to keep Harper……unless the Yankees come out and force his hand, and say they will give Harper 1/2Billion. Altherr was the DH today, so he didn’t actually play two full games. The Threshers are on the road until the 21st. They complete a 4-game series in Palm Beach Saturday then play a 4-game series at Bradenton, Sunday-Wednesday. I’d like to see him in the Bradenton series (or in Reading or Lehigh Valley) so I can see more of Pelletier who seems to be the guy losing at bats due to Altherr’s rehab. I noticed Kyle Young pitches exclusively from the stretch. I think he is the young player who will gain the most from instructs. I can see his velo jump from 88-90 to the mid 90’s as he fills out and improves his mechanics. His closer to the plate release point and stride, due to his height, does also give him a ever slight advantage. just for fun thought. but Astros signing Gurriel- realize he will need time to prep and they could move him over to first and DH Reed/Gattis, but if at third, would seems to fully block Bregman. With Carlos Gomez having a bad year and a FA, the idea of a Odubel/Bregman trade popped into my head, with Bregman playing second here. in a hypothetical world, Odubel and ? for Bregman. Question you need to ask would you JP for Herrera ? That’s what your asking Houston to do . Bregman is there JP so you would probably have to included VV with Herrera now that’s alot . See Houston doesn’t see Bregman as blocked they see him as the biggest trade chip in the league. Let the bidding begin. That’s trade JP for Herrera . I had brought up the possibility of trading Franco for Bregman the other day then the Astros signed Gurriel. If Bregman can stay at SS (I don’t think he can) you would have to add a mor arm that was at least close to the MLB. However if you think Bregman is destine for 3rd or 2nd I wouldn’t give up more than Herrera. Best case scenario for Bregman IMO is a .300 hitter with 30hrs and an obp around .400. Don’t get me wrong that is a ridiculous ceiling I don’t think he can carry that much power while keeping the great plate discipline but it possible. I also think he loses defensive value at 3rd but that’s not a guarantee he moves off of ss. I would do that trade mainly because of the many young CF types on the farm plus Altherr can play a good center and Williams has played a good amount of it in the minors. Quinn if he ever gets healthy enough to play a full year can be an option. Herrera is a big chip and he’s under team control for a while so for me if I’m trading him it’s got to be for someone like Bergman. Whoa…..Thompson, Williams and Knapp….smokin’ tonight. How about some young Ben Pelletier in Blue Jays Tournament. Even that young, 14-years old, he was mashing.